(NaturalNews) The world's most evil corporation is trying to buy out another of the world's most evil corporations to become one giant, monopolistic force of unstoppable abomination throughout the globe. Monsanto, a household name in toxic chemicals and untested GMOs (genetically modified organisms), has asked Syngenta, a major competitor, for its hand in marriage, a potential merger that would consolidate control over more than 35% of the world's seed supply into the hands of just one entity. Monsanto's first proposal, offering Syngenta a sizable "dowry" of $45 billion, was rejected. But Monsanto isn't giving up, with reports indicating that a deal between the two companies is still a strong possibility. Both corporations created their own advisory teams to come up with a solid negotiation plan, implying that it's only a matter of time before Monsanto gobbles up yet another large piece of the agricultural pie. "No single corporation should be allowed to wield the sort of power that comes from a near-monopoly on our global food system," reads a statement issued by the group SumOfUs, which vocally opposes the merger on all counts. "Imagine this: Monsanto eliminates one of its biggest competitors and tightens its grip on the global farming industry. Our precious wildlife like bees, birds, and butterflies suffer as Monsanto spreads its pesticides further and wider. More and more small-scale farmers are bullied if they refuse to buy Monsanto's seeds." 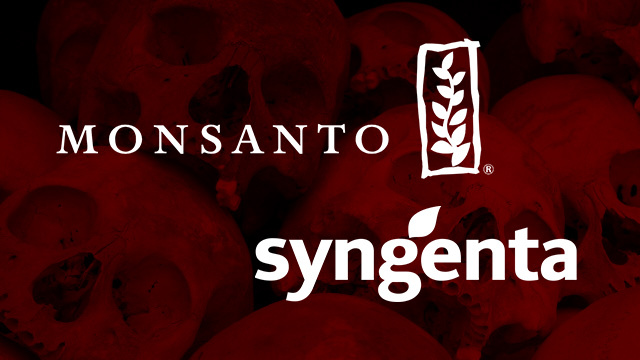 Since the merger would create one of the most egregious corporate monopolies the world has ever seen, Monsanto has offered a small concession -- it plans to sell off Syngenta's seed business, which represents about 21%, or $3 billion, of its annual sales. At the same time, the merger would allow Monsanto to claim its headquarters in Switzerland, where Syngenta is currently based. This is significant because Switzerland, as you may already know, is considered a tax haven. Corporations that move their headquarters there, at least on paper, know that they'll be taxed less than they otherwise would be in their home countries through a loophole known as corporate inversion, of which Monsanto plans to take full advantage. "In its last year, Monsanto paid $648 million in federal income taxes on U.S. pre-tax income of $2.4 billion, an effective tax rate of 26.6 percent," reports the Center for Effective Government (CEG). "In addition, Monsanto reported that it held $4.4 billion of profits offshore. Monsanto could owe as much as $1.5 billion in U.S. taxes on these offshore profits, an amount that could be permanently avoided if the new company engages in complex legal and tax transactions following an inversion." Not surprisingly, Monsanto's ability to potentially acquire Syngenta isn't at all the result of honest business practices. The company's continued expansion has only been made possible through taxpayer extortion, with the U.S. government using tax dollars to fund programs and services to further Monsanto's control over agriculture. "Monsanto Company's numerous products build on the research advancements made possible by taxpayer-funded programs, such as programs at the National Institutes of Health and the National Science Foundation," explains CEG. "Monsanto Company's billions of dollars of profits depend upon a robust U.S. patent protection system provided by U.S. taxpayers and a workforce trained and educated with significant federal, state and local resources."